Introducing our delicious and nutritious Punchy Pineapple with a delectable and unique flavour. What are you waiting for? Grab yours now! 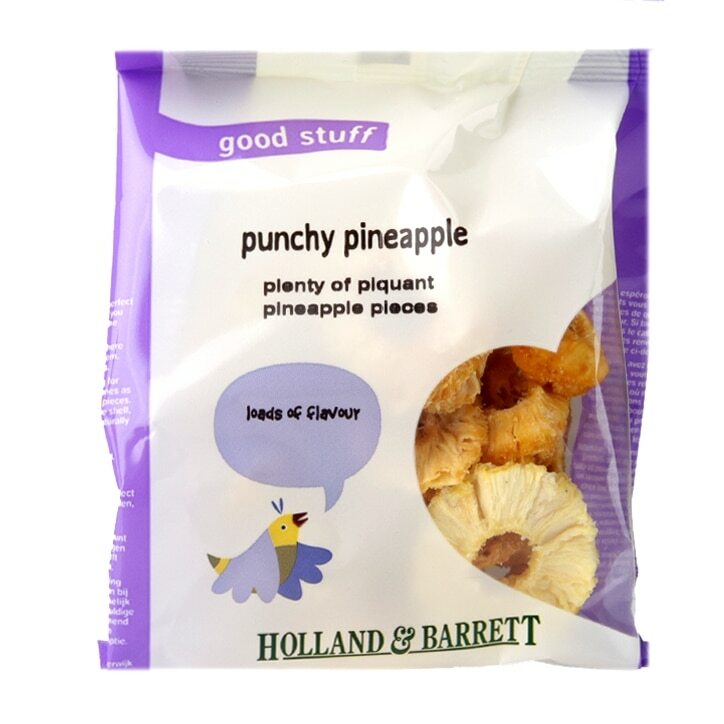 Holland & Barrett Pineapple Pieces is rated 4.7 out of 5 by 7. Rated 5 out of 5 by sitedoesntrecogniseme from Will buy this again Chewy and full of flavour. Not too sticky so ideal for lunch boxes. Rated 5 out of 5 by Mike16 from Great product, great quality Good all round dried Pineapple, natural sweetness though pricey once open it's difficult to stop eating it very nice. Rated 5 out of 5 by JPM28 from Really delicious and very versatile. Very tasty and delicious as a snack with wine and tea or coffee. Rated 4 out of 5 by ChrisLondon from Much as one would expect dried pineapple to taste Much as one would expect dried pineapple to taste and feel like. Better than picking up a confectionery snack when your out and about. Rated 5 out of 5 by Barbarita from Still my Favourite I've tried lots of different brands of dried pineapple & never found better. Not the cheapest by a long way but without doubt the best. Great flavour, not sweetened. Great texture, deliciously chewy. Only problem........ once the bag is open, I cannot put it down!